The critically acclaimed exhibition “Between Worlds: The Art of Bill Traylor” will remain open to the public through Sunday, April 7, allowing visitors an additional three weeks to experience this major retrospective. The exhibition brings together 155 drawings and paintings from 51 public institutions and private collections to provide the most encompassing and in-depth study of the artist to date. In a tremendous show of support, all lenders agreed to the extension. Organized by Leslie Umberger, curator of folk and self-taught art at the Smithsonian American Art Museum, the exhibition presents a comprehensive picture of Traylor’s stylistic development and artistic themes, explored in the context of the profoundly different worlds Traylor’s life bridged: rural and urban, black and white, old and new. The museum is the sole venue for this exhibition, which was long awaited by enthusiasts, scholars and collectors.” “Between Worlds” was called “a stunning retrospective” by The New Yorker, and was listed among the top 10 exhibitions of 2018 by critics at The New York Times and The Washington Post. “It is only with extraordinary effort and cooperation that an exhibition of this magnitude can be extended, and in this case we were fortunate to have many like minds share the belief that Bill Traylor’s most shining moment should not be cut short,” said Umberger. More than 575,000 visitors have come through the museum’s doors since the exhibition opened Sept. 28, 2018. The museum estimates that 150,000 visitors were not able to see the exhibition when the Smithsonian museums were closed from Jan. 2 through Jan. 28 due to the partial government shutdown. The exhibition galleries were dark during this period, an important detail that allowed the fragile works on paper to remain on view for an additional few weeks. Bill Traylor (ca. 1853–1949) is among the most important American artists of the 20th century. Born in antebellum Alabama, Traylor was an eyewitness to history—the Civil War, Emancipation, Reconstruction, Jim Crow segregation, the Great Migration and the steady rise of African American urban culture in the South. In the late 1930s, a decade after leaving plantation life and moving to the city of Montgomery, Alabama, Traylor took up pencil and paintbrush and created a visual autobiography, images on discarded cardboard extracted from his memories and experiences. When he died in 1949, Traylor left behind more than 1,000 works of art, the only known person born enslaved, and entirely self-taught, to create an extensive body of graphic artworks. The exhibition is accompanied by a monograph written by Umberger with an introduction by acclaimed artist Kerry James Marshall, published by the Smithsonian American Art Museum in association with Princeton University Press. The book is available for purchase in the museum store and online ($60, hardcover). On Friday, Feb. 22, the museum will present an afternoon of lectures and discussions inspired by the exhibition. Participants include: Radcliffe Bailey, artist; William Ferris, University of North Carolina at Chapel Hill; Randall Seth Morris, independent curator, writer, and co-owner of Cavin-Morris Gallery; Diana Baird N’Diaye, Smithsonian Center for Folklife and Cultural Heritage; Richard J. Powell, Duke University; and Umberger. Margaret Lynne Ausfeld from the Montgomery Museum of Fine Arts is the moderator. The program will be webcast live on the museum’s website and available for future viewing on the museum’s YouTube channel. A full program and schedule is available online. This program is the inaugural symposium in the Margaret Z. Robson Symposium Series. Support for the series is provided by Douglas O. Robson. Friday, March 1, at 7 p.m., the museum presents a special improvisational jazz performance inspired by Traylor’s art with guitarist Marvin Sewell and pianist Jason Moran. 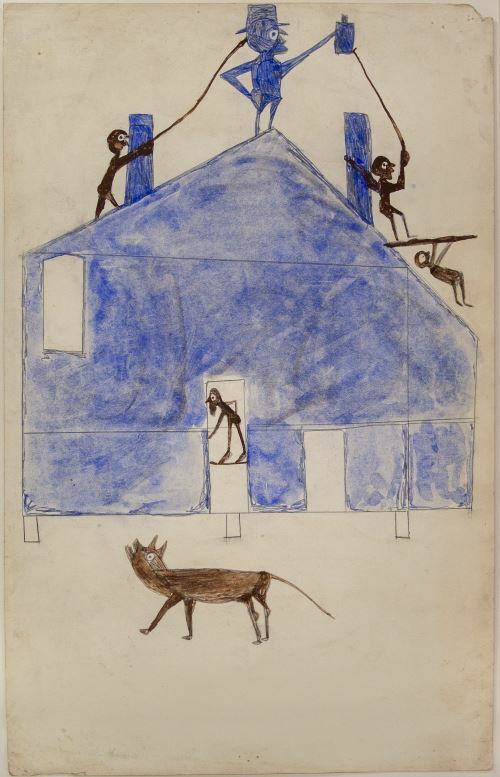 Tickets for “Bill Traylor Blue” are available for purchase online ($25). This exhibition is organized by the Smithsonian American Art Museum with support from ART MENTOR FOUNDATION LUCERNE, Elizabeth Broun, Faye and Robert Davidson, Sheila Duignan and Mike Wilkins, Josh Feldstein, Jocelin Hamblett, Herbert Waide Hemphill Jr. American Folk Art Fund, Just Folk/Marcy Carsey and Susan Baerwald, Lucas Kaempfer Foundation, Marianne and Sheldon B. Lubar, Margery and Edgar Masinter Exhibitions Fund, Morton Neumann Family Foundation, Douglas O. Robson in honor of Margaret Z. Robson, Jeanne Ruddy and Victor Keen, Judy A. Saslow, and Kelly Williams and Andrew Forsyth. The Smithsonian American Art Museum celebrates the vision and creativity of Americans with artworks in all media spanning more than four centuries. Its National Historic Landmark building is located at Eighth and F streets N.W., above the Gallery Place/Chinatown Metrorail station. Museum hours are 11:30 a.m. to 7 p.m. daily (closed Dec. 25). Admission is free. Follow the museum on Facebook, Instagram, Twitter and YouTube. Museum information (recorded): (202) 633-7970. Smithsonian information: (202) 633-1000. Website: americanart.si.edu. Note to editors: Selected high-resolution images for publicity only are available through the museum’s Dropbox account. Email AmericanArtPressOffice@si.edu to request the link.